The dill with the smoked trout was a good match but there was so much trout! There wasn't as much oil in the dish as I had anticipated either which is always a thumbs up. Oh man! I loved Copo's roast pork sandwich! The roast pork was a little bit dry but but but the relish was so dam delicious. The sweetness from the pear relish together with the aioli were a match made in heaven. No seriously, it was one of the best 'sauces' I have had. I would definitely come back for this but you can't order it too late as these sandwiches sell out like hot potatoes. I think I scored one of the last few because we heard another customer ordering it and they were sold out. ive heard so much good stuff about this place! love the cute little typewriter! 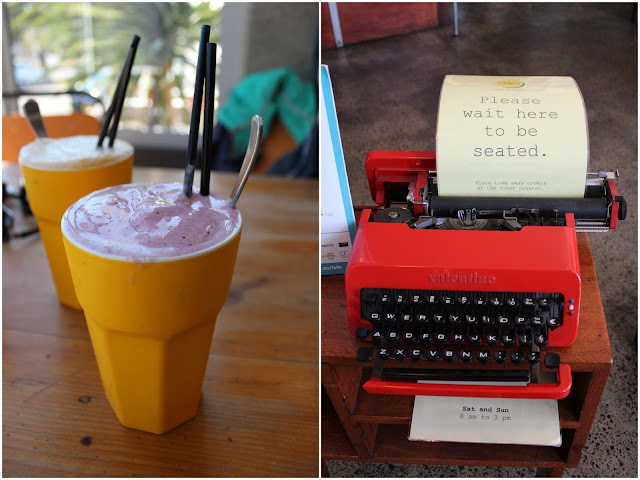 omg how cute is that typewriter! yum! the baked eggs look pretty good, I've heard great things about copo. Sounds like a nice little neighbourhood cafe! I'd be having the baked eggs, as I'm a bit of a sucker for those.